The holidays are upon us and we have the perfect event to usher in the JOY of the Christmas season! 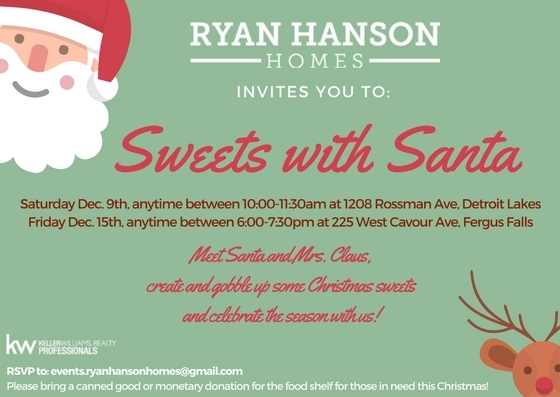 Meet Santa and Mrs. Claus and gain that perfect photo opportunity, create and gobble up some Pinterest worthy Christmas sweets, play some reindeer games, dance and sing to Christmas carols if the mood hits and celebrate the season with Ryan Hanson Homes. We will be wearing our ugly Christmas sweaters and challenge YOU to top our fashionistas. We have TWO locations for you! Friday, December 15th anytime between 6:00pm and 7:30pm at 225 West Cavour Avenue in Fergus Falls. Please bring a canned good or monetary donation for the food shelf for those in need this Christmas!